- Christmas tree doesn't care how many other Christmas trees you've had in the past. 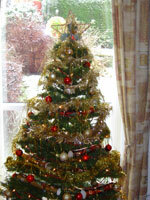 - Christmas trees don't get mad if you use exotic electrical devices. - A Christmas tree doesn't care if you have an artificial one in the closet. - You can feel a Christmas tree before you take it home. - A Christmas tree doesn't get mad if you look up underneath it. - When you are done with a Christmas tree you can throw it on the curb and have it hauled away. - A Christmas tree doesn't get jealous around other Christmas trees. - A Christmas tree doesn't care if you watch football all day. - A Christmas tree doesn't get mad if you tie it up and throw it in the back of your pickup truck.